All right, now my brain has properly recovered, I can write about the weekend. For me, WorldCon didn't start until Friday night. Circumstances kept us from leaving Austin for San Antonio until much later than I had originally planned. By the time we reached the Convention Center, registration had closed. So we weren't able to get our badges yet, but the guy we asked about it told us that unless we wanted to go to the Dealer's Room, it really wouldn't be an issue. At that hour there were almost no panels going on, so we just started looking around for familiar faces. After some wandering and we found the wonderful Stina Leicht, who was giving advice to two people* who had been part of the the Con's Writers' Workshop. (Stina and I work the ArmadilloCon one, but we had nothing to do with this one.) She led me to the hotel bar, where the action really was happening. We split up so she could drop her stuff off in her room, and a little while later I got this as a text: "Do you want to go to the TOR party?" The answer to this question is going to be YES. So Stina collected Nicholas and I and up we went. And it was lovely and interesting, and Marco Palmieri was the bartender. I've been a big fan of Marco's since Star Trek books are totally my reading guilty pleasure, and he was the editor over there for their most interesting run. Also of note: David Brin showed me his fillings. This was, apparently, proof of why he is a much better writer than young whippersnappers like myself, since he gets radio reception in his head. Now, I've heard some chatter out there about how old the WorldCon crowd is and such, but let me tell you, having there be a place where you are still considered "one of these young kids" at 40 isn't all that terrible. 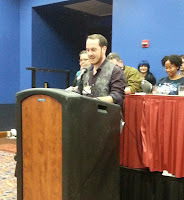 Saturday involved going to panels, and then it was time for the Rayguns reading and signing. Everyone present read one page from their story, which we did very efficiently. I was pleasantly surprised, I thought we might go into overtime. Fortunately, "Jump the Black" is in the back half of the book, and we went in order, giving me plenty of time to just marvel at the fact that I was going to give a reading from my story out of an actual book, and figure out just what my "one page" was going to be. Then we formed a line of chairs and started signing for the crow, assembly-line style. That was a lot of fun, even when the publishers brought out two boxes of books for us all to sign. So afterwards, we went to Drinks With Authors, the event Myke Cole and Steve Drew from Reddit Fantasy put together. This was quite a fantastic event, and Nicholas was completely in charge there. Seriously, if you want to rule a bar event, being an intelligent and articulate 13-year-old doesn't hurt. He stood out, is what I'm saying, but he backed it up by having things to say that kept people's attention. He also won a first edition of Robin Hobb's first book, which Wesley Chu desperately wanted. Wes eventually agreed to whatever devil's bargain Nicholas forced him into in order to get the book. Myke was quite enthusiastic in his appreciation of my son. It's a good thing my cousins*** had toughened me up in my youth, and I could take an affectionate chest pounding from his military-grade arms. Sunday was a bit of a blur-- again, a few panels during the day. Now, I haven't talked too much about the sexual politics of WorldCon, and fortunately I didn't see or hear of any specific harassment issue. 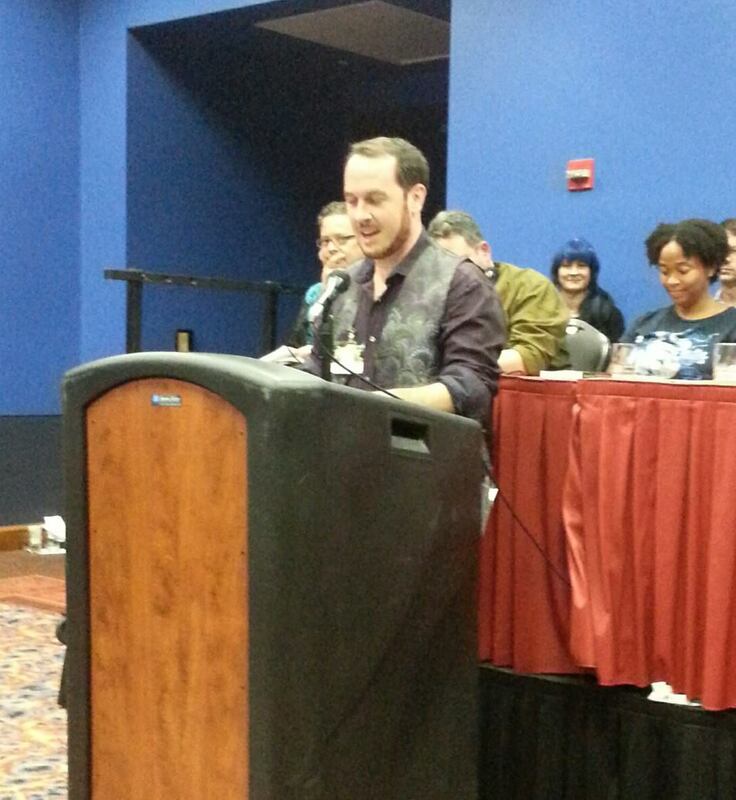 However, at one of Sunday's panels, there was an incident that fully falls into the realm of "mansplaining". In a panel on cosplaying and gender issues, where the panel consisted of three women, they were talking about body image and how that affects their choices. A man from audience basically told them, "You shouldn't worry about that, because we always think you look lovely", missing the point spectacularly. The panel and women in the audience smacked him down quite well, but I doubt what they were saying drilled into his skull. Better things on Sunday: Nicholas made a steampunk gun. He also bought a shoulder-holster, and just having those two things earned him some "good costume" comments. I thought that was funny. Also, there was the Campbell panel, in which the four Campbell nominees all wore tiaras, and got Ben Bova to wear one as well. Worth the price of admission just for that. Then there were the Hugos! I'm definitely glad I went there, because it was very much worth it. It's the Nerd Oscars, of course you go. Afterwards, I introduced myself to the editor from DAW, and then hung out at the bar for a while before finding my way up to the Loser Party. Again, a thing you go to if you can. Frankly, at this point, even though I barely had anything to drink, my head was swirling with Con Overwhelm. So details are fuzzy. I'll simply list further wonderful people whom you should read: Max Gladstone. Nancy Hightower. Valya Dudycz Lupescu. Chuck Wendig. That's all I got. Time to get back in the word mines. *- Something funny about the scope of WorldCon-- and it is quite huge. There were plenty of people I know, that I know were there that I never saw. And others who I only saw in brief passing. Yet there were other people that I ran into constantly, and that included the two people Stina was talking to. ** I'm sure there's some sort of movement-of-particles math that would explain it. **- If you were one of those two people, I'm sorry, but I've forgotten your names completely-- but you were both very charming people who I hope have a lot of success in your future, and feel free to contact me. ***- At some point, I need to explain the rules of Quarterball.